The 32-year-old street painter from Kevelaer, Germany Frederike Wouters has been active since 18 years in the field of street painting. After school she trained as a horse breader and trainer (2005 till 2007) and worked for three month as a horse safari tour guide in Namibia. street painting accompanied her during her whole learning path and helped her to finance her studies of marketing management (tourism and event management) in the Netherlands and Spain (2008-2012). After her bachelor degree, since 2012 she works as a freelance artist for her company FreddArt Streetpainting. 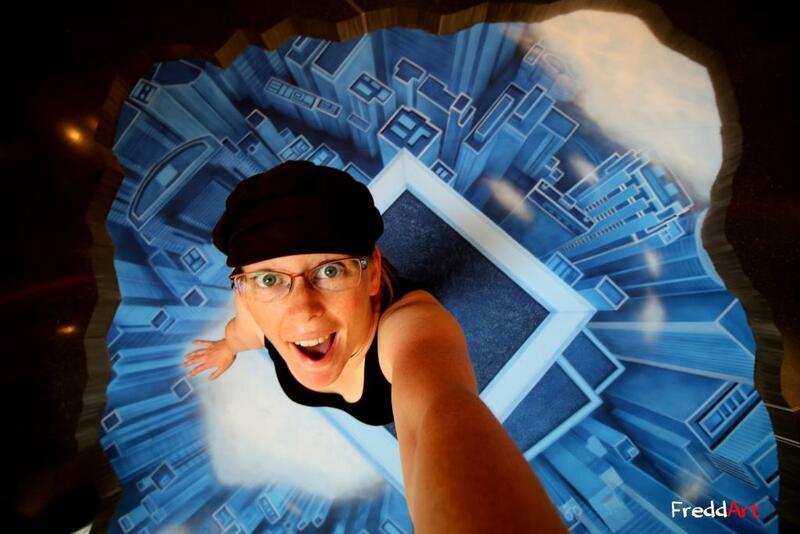 She leads street art workshops, creates wall-paintings and 3D streetpainting illusions. She won numerous prizes at international street painting competitions and showed her streetart in Germany the Netherlands, Belgium, Switzerland, Austria, Italy, France, United States, the United Emirates of Arabia, Bulgaria, Latvia and Mexico. In 2014 she even broke a Guinness world record by painting together with many other artists the world’s largest anamorphic streetpainting of a huge 3D megalodon shark in Venice Beach Florida. As a professional eventmanager she also organizes streetpaintingfestivals such as the 3D Streetpaintingfestival Kerkrade 2013 in the Netherlands, the Streetartfestival Sögel 2014 and 2016 in Germany, the WoodArt Gallery Krefeld in 2015 and the Rhine side Gallery Krefeld in 2017. In August 2017 she organized the first international Madonnari Festival in her hometown Kevelaer and promoted the traditional Italian chalk art in Germany. She never passes up an opportunity to paint the grey patches in the cities throughout the world with colours while traveling, at events or for advertising purposes. In 2015 she opened an art studio and gallery called “KUK-Atelier” in her hometown Kevelaer where she organizes streetart workshops, concerts and meetings for local artists. I am doing 3D streetart since 2007 and I was inspired by my good friend Edgar Müller who was the first person I saw doing this kind of anamorphic art. In 2007 he gave me some advices on my very first piece at the streetpaintingfestival in Geldern Germany. It was the same year I have been to the Madonnari Festival in Grazie di Curtatone together with Edgar and some other German streetpainting artists I already knew as my little streetpaintingfamily. After the festival we went all together to the Garda lake and spent a week of holiday together. It was a very inspiring time where we talked a lot and came up with the idea to do a huge streetpainting together. A few days after everybody went back home we meet with 12 artists in Cologne and did a huge painting of Tiepolo in front of the Dom cathedral in Cologne. The groups experience was fantastic, inspiring and very impressive. It was a key moment for my future career as a streetpainting artist and festival organizer. In the following years I improved my 3D skills by trial and error, got first commissioned jobs and could do a living by doing streetart. As the 3D art became more and more popular and I had finished my bachelor degree, since 2013 I worked as a freelance 3D artist and organized streetartfestivals for different cities. My motivation for organizing streetartfestivals is creating a nice groups- and art experience for the artists as well as for the audience. Streetart means to me, art that goes to the people, that they can see in their everyday life. No matter where the people come from and how much money they have – this is free art for everybody and easy to understand. Streetart surprise and inspire the people, especially young people and give them a connection to art. Most people are disconnected with art – streetart is a great opportunity to call for attention in the public and give incentives for critical and creative thinking. 3D streetart make the people interact and be a part of the artwork. I like it when the people share their interactive photos with friends and tell stories about their artexperience. When I am painting, my themes are mostly connected to nature and it’s animal- and wild life. I like it when nature conquer back urban, human made locations. Sometimes animals symbolize people or show human behaviour or a human-made situation. The presented situations always reveal my own feelings, ideas and sometimes critical opinions towards the presented topic. My paintings should make impossible things possible, tell stories, move the people to interact and share their experiences with others.